Derek Vineyard is paroled after serving 3 years in prison for brutally killing two black men who tried to break into/steal his truck. 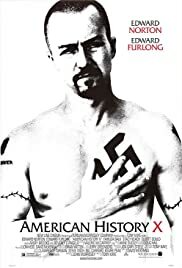 Through his brother, Danny Vineyard's narration, we learn that before going to prison, Derek was a skinhead and the leader of a violent white supremacist gang that committed acts of racial crime throughout L.A. and his actions greatly influenced Danny. Reformed and fresh out of prison, Derek severs contact with the gang and becomes determined to keep Danny from going down the same violent path as he did. Powerful portrayal of Neo-Nazi movement in America. Told in series of flashbacks. Flawless acting by Edward Norton. Does its best to make the point that no one is ever right aand no one is ever wrong. I have a friend who was a Nazi and a racist. But upon walking out of the theater after this movie he hung his head in shame. This is why the film industry began.